"Today we come against addiction , heroine, cocaine, alcohol, any mind and mood altering substance, We declare it was never meant for us, we denounce it in the name of Jesus, heavenly father YOU told us, no temptation would overcome us but what is common to us all and with them temptations you'll give us a way out, Heavenly Father please help your people to see their way out and have the strength to take it...I declare your people are over comers and will be free from addiction , in the name of Jesus-Amen"
The Lifehouse - 4th Street was the first of our sober living facilities. 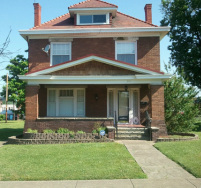 It is located near the Southside of Huntington, WV in a clean family neighborhood. This historic three-story home includes semi-private bedrooms, a living room, family room, exercise area, and office. To either side of this original house are three more Lifehouse residences for men participating in the 4th Street program. Each residence has laundry facilities, kitchen/dining areas, and porch/patio. These facilities foster the atmosphere of brotherhood and family in meeting 57 men as they both walk out their journey of early recovery and walk into becoming the men they were always created to be. The FIRST installment of The Life House's sober living choices for women is The Lifehouse - 5th Avenue. The home opened in April 2013. It serves 14 women during their sobriety journey and coincides with the program guidelines and structure of The Lifehouse - 4th Street. The Lifehouse - 5th Avenue includes a living room, family room, dining room, back deck, meeting area/office, and a clothing donation area. As the Women's Lifehouse program expanded, 2 more houses have been added on West 5th Avenue and Jefferson Avenue. Collectively, these houses comprise our Women's Program which continues to pull from the umbrella Lifehouse program in meeting 30 - 35 women in their recovery from addiction, and ushering them to where they were always meant to be. The Lifehouse is excited about this one-of-a-kind intensive start to our Men's Program. Having translated the successful "Farm" program from a rural area to within a half block of our recovery community, we kept all the benefits of the intensive community start with additions of successful alumni being within walking distance to share their experience and insight. The site is used as a stand-alone home for men which affords them the opportunity of working, separately and apart of everyday demands, to gain the intensive and invaluable start to a successful recovery.